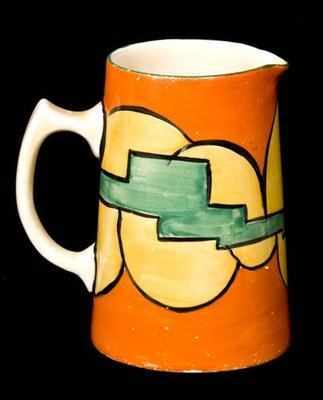 Jug/Pitcher in the rare Castellated Circle pattern. Size is 4.5 inches tall. No damage or restoration. Nice dramatic example. Few specks to orange. Dates to 1929. Signed Bizarre by Clarice Cliff in large Handwritten Script. Price £345.